How to visualize high-resolution omics data in different groups of genomic regions? How to evaluate differences in high-resolution omics data between groups of genomic regions? How to detect locations and scales at which the significant effects unfold? IWTomics implements the Interval-Wise Testing (IWT) for omics data. This inferential procedure tests for differences in “Omics” data between two groups of genomic regions, and does not require fixing location and scale at the outset. In this tutorial we use real data about endogenous retroviruses (ERVs) in mouse. 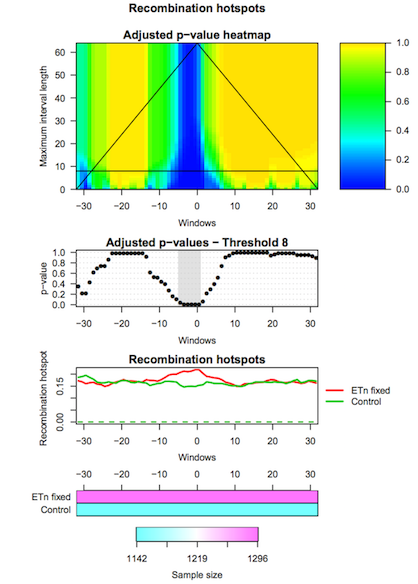 In particular, we compare recombination hotspots in the flanking regions of fixed ETn versus control regions. The dataset contains two region datasets “ETn fixed”, “Control” and one feature “Recombination hotspots content”. The region dataset “ETn fixed” contains 1296 genomic regions of 64 kb surrounding fixed ETns elements (32-kb flanking sequences upstream and 32-kb flanking sequences downstream of each element). The region dataset “Control” contains 1142 regions of 64 kb without elements, used as control in the test. The regions are aligned around their center (i.e. around the ETn integration sites). The data we use in this tutorial is available at Zenodo. The first tool (IWTomics Load Smooth and Plot) imports a collection of genomic region datasets, and associates to each region multiple genomic feature measurements. It allows to align the regions in multiple ways (center, left, right or scale alignment), to smooth the feature curves (possibly filling gaps in the measurements) and to create a graphical representation of the feature measurements in each region datasets (aligned curves or pointwise quantile curves). Select the two region datasets ETn_fixed.bed and Control.bed. Select the region header file regions_header.tabular. Select the feature file Recombination_hotspot.txt. Select the feature header file features_header.tabular. Start positions are 0-based in this example; all region alignments are equivalent in this case. You can choose to smooth the feature curves. Select the graphical representation type Pointwise quantile curves (boxplot). The second tool (IWTomics Test and Plot) statistically evaluates differences in genomic features between groups of regions along the genome. In particular, it implements the Interval-Wise Testing for omics data, an extended version of the Interval-Wise Testing for functional data presented in Pini and Vantini (2017). It allows to perform multiple two sample permutation tests between pairs of region datasets, on several features. It returns the adjusted p-value curves for every test and all possible scales. Moreover, it creates a graphical representation of the Interval-Wise Testing results and a summary plot (optional) with p-values at the maximum scale. The tool IWTomics Plot with Threshold on Test Scale permits to select the scale to be used in the plots. Select the IWTomicsData Object, Region Dataset IDs, and Feature IDs created during Step 1. Select pairs of genomic region datasets to be compared using two-sample Interval-Wise Testing. In this example we consider one two-sample test contrasting ETn_fixed (select it as Region 1) to Control (select it as Region 2). Select feature measurements to be tested. 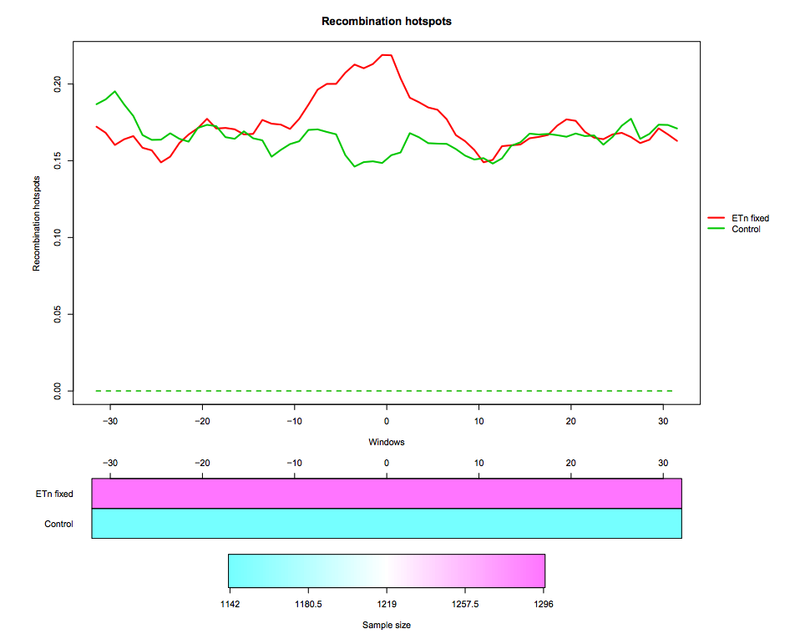 In this example, select Recomb_hot feature. You can choose the test statistic, the number of permutations, and the significance level of the test (alpha). The third tool (IWTomics Plot with Threshold on Test Scale) allows to select the scale for the Interval-Wise Testing results. In particular it returns the p-value curves for the different tests performed at the selected scale, and it creates a graphical representation of the Interval-Wise Testing results and a summary plot (optional) at the selected scale. Select the IWTomicsData Object with Test Results, Test IDs, and Feature IDs created during Step 2. Select the scale to be used in Interval-Wise Testing results and plot. Select the test identifier ETn_fixed vs Control, the feature identifier Recomb_hot, and the scale 8 (8-kb scale). Read more about IWTomics here. This material is the result of a collaborative work. Thanks to the Galaxy Training Network and all the contributors ( Marzia A Cremona, Fabio Cumbo)!